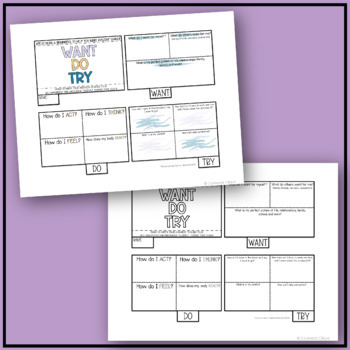 This product, by Counselor Clique, is the What Do Try Reality Therapy Flipbook. 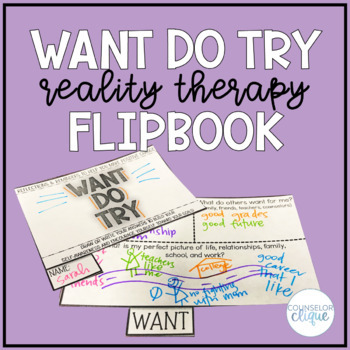 The What Do Try Reality Therapy Flipbook is a downloadable PDF packet for school counselors to print out for a student to put together and reflect on their experiences and problems. Cut out, write or draw, and staple together. Email me, and I'd love to answer any questions you have! How do I stay updated on new products, sales, and freebies? **Follow Me** by clicking the green star by my store name. This is the best way to keep up with what’s happening at Counselor Clique on Teachers Pay Teachers! Come back and rate your purchase to earn FREE TpT credits to spend in any TpT store! How Should I Follow Counselor Clique on Other Platforms? Check out my Twitter, blog, Pinterest, and Instagram. Copyright © Counselor Clique (Lauren Tingle). All rights are reserved by author. Your purchase is for one school only. Please purchase multiple user licenses if you plan to use in different settings; these are available at a discounted rate. Clip art and other elements in this product are copyrighted and cannot be used without a license.